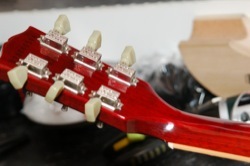 The guitar suffered a broken headstock while still in its case. 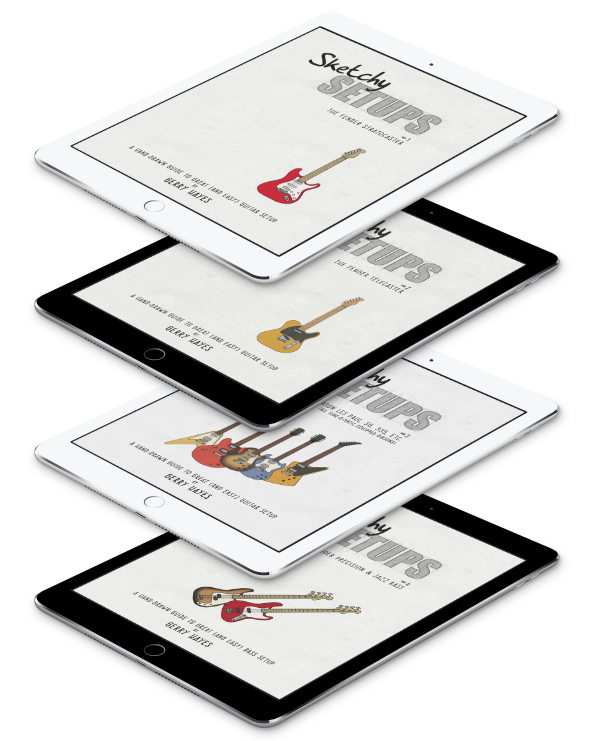 A neck-break in the case was the final straw for the owner—who’s had more than one Gibson require a neck repair— and he wanted to consider options to help prevent it happening again. We talked over the pros and cons of the various solutions and eventually decided on a backstrap overlay. This methodis sometimes used where the break is too nasty or offers insufficient glueing surface to guarantee a sound repair. A backstrap was not a necessity to repair this particular break (and, indeed, it entailed additional expense to carry out) but the owner wanted to do something that would go towards preventing a reoccurrence. 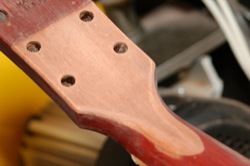 A backstrap overlay involves removing some wood from the rear of the headstock and some way past the broken section. 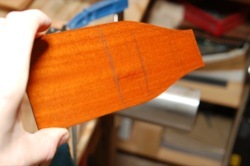 A patch is cut from new wood and is bent to conform to the curve between headstock-angle and neck. Because the inlaid patch has been bent to shape, its grain has no run-out and remains strong. I explained to the owner, and I will to you, that this offers no guarantees. 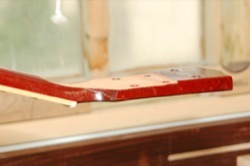 However, this method of applying bent wood certainly strengthens a weak area of the guitar and it will be stronger than the original. The first thing that needs to be done is to repair the existing crack. I’ve discussed this in a previous post so I’m not going into any detail here. 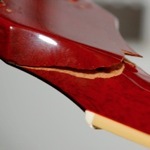 A repaired crack is necessary so that the section to accommodate the backstrap can be removed. My usual preference, when doing this, is to run the strap right to the end of the peghead as the inlaid wood is more discrete. In this case, doing so would have removed the serial number and ‘Made in USA’ stamp and I decided keeping these better served the future value of this guitar. 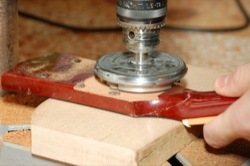 A 3mm section is removed from the back of the headstock. 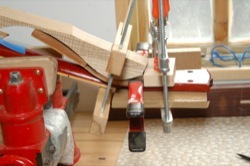 The Saf-T-Planer allows me to do this cleanly right up to the point the neck angle gets in the way. The remaining section along the neck is removed with hand tools. 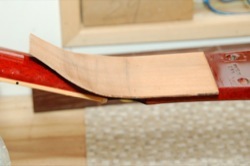 A piece of mahogony is thicknessed to the appropriate size and cut out roughly to shape. Out comes the trusty bending-iron and I work the wood into a gentle bend to conform to the section I’ve cut in the neck. Some inelegant, but effective, clamping and glueing and the backstrap is in place. But it’s not pretty. The patched in piece does allow you to get a look at the bend clearly though. Because the grain in that patch (backstrap) runs—uninterrupted—from end to end it’s much stronger than the piece that was removed. 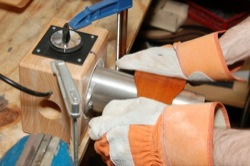 A little work with routers, drills, knives and sandpaper and the new piece looks a little more like a headstock should. Some touch-up work helps hide the evidence. A (relatively invasive) repair like this can never be completely invisible under a translucent finish but this is pretty discrete. We’ve repaired and strengthened a broken-necked SG and preserved the serial number. Not a bad few day’s work.